This edition of Creative Chronicles focuses on Audio. Players increasingly expect more from games and the quality of audio production is no different. Dynamic soundscapes are complex but when done well, they are key to player immersion. With the possibility of multiple activities happening on screen, game sound must convey action clearly and in different ways. The interactive nature of gameplay stands it apart from the music and film industries where audio is linear. With games, it is not possible to know exactly what the player will do and where they will go, the audio must account for these complexities, creating sound for different locations, interactions, characters and events. There are four core disciplines that fuse together to deliver the audio experience you hear in video games: Sound Design, Music Production, Dialogue Production and Sound Programming. Game audio has many uses, it can add weight and physicality to visual elements on screen, provide ambience, support story-telling or score emotional cues. The audio disciplines can combine to create a soundscape that isn't confined to the screen and when used effectively, can help totally captivate the viewer. That is a broad description of what collectively game audio does and in reality, the job involves many responsibilities and skill-sets that vary depending on the genre, scope, timescale and budget. Sound designers can be difficult to find in the UK. For games development, a variety of skill and experience is needed. For example, during a project a game sound designer will undertake studio and field recording sessions, create multi-layered sound design, work on post production for linear pieces and design and implement interactive systems that influence how audio behaves in the game. The specialist skills needed for games audio, which differ to those required in film and large post-production houses, mean there is a limited pool of experienced specialists. Additionally, in the UK we are seeing fewer students studying music and music technology courses. 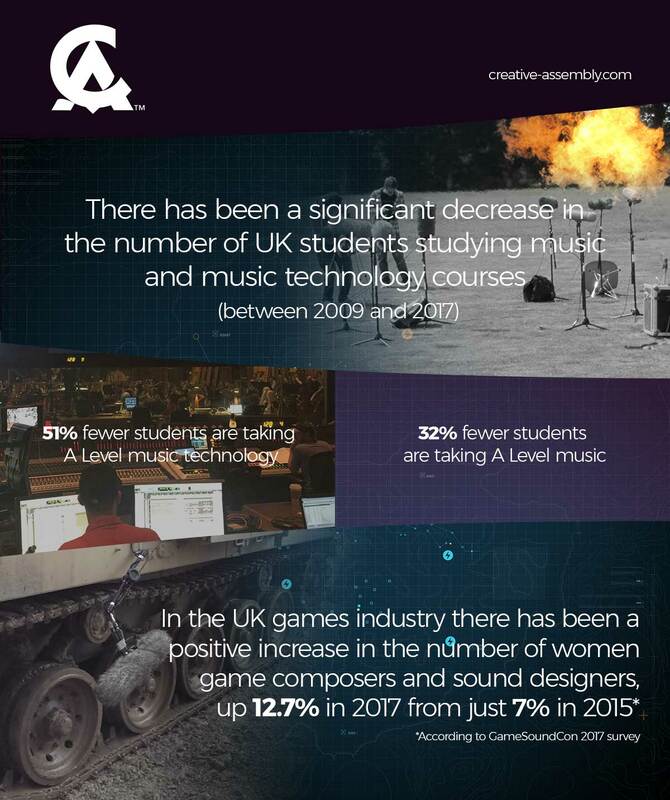 In 2017 there were 58% fewer A-Level Music Technology students and 32% fewer A-Level Music students than in 2009. Game audio is integral to the overall game design. It increases player understanding of objectives and can act as a guide. A huge amount of game design involves communicating information to the player, whether it’s that enemies are nearby or health is low, and a lot of the time this is done through audio. The audio team must work alongside many other disciplines since audio touches on almost every aspect of a game. In contrast to other industries, audio production in games is not a post-production role. The team collaborate with animators, artists, game designers and programmers to achieve creative goals. Often, audio will start to take shape before the feature it is designed for has been produced; in these instances, audio is part of the process and helps to inform the end result as opposed to servicing a finished product. For audio specialists, there is a huge amount of creative freedom in this approach. There is varied work to get involved with; recording, editing, integrating and mixing. 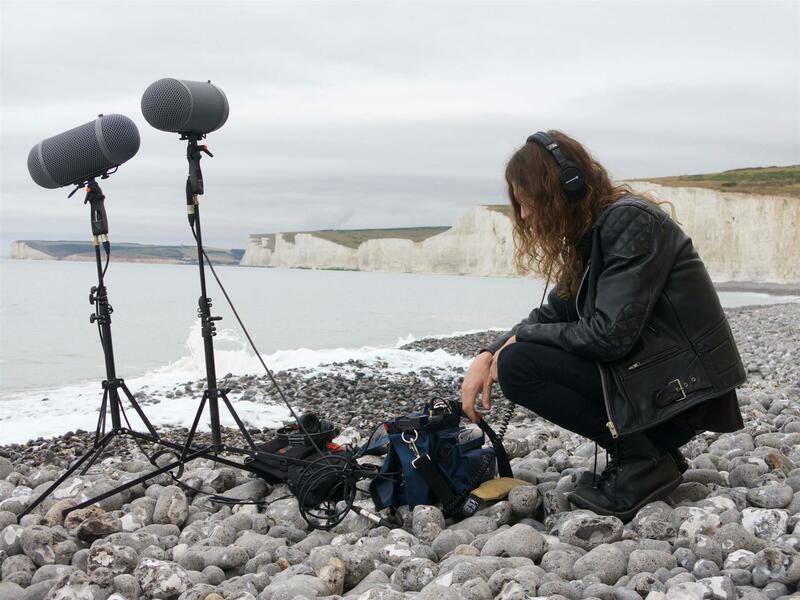 As a snapshot, on any given day sound designers can be working on location, field recording or creating foley integral to producing unique sound effects. Dialogue engineers can be working through casting auditions or recordings for monsters or in-game characters with well-known actors. Music recording with live orchestras and choirs might be taking place at international studios. 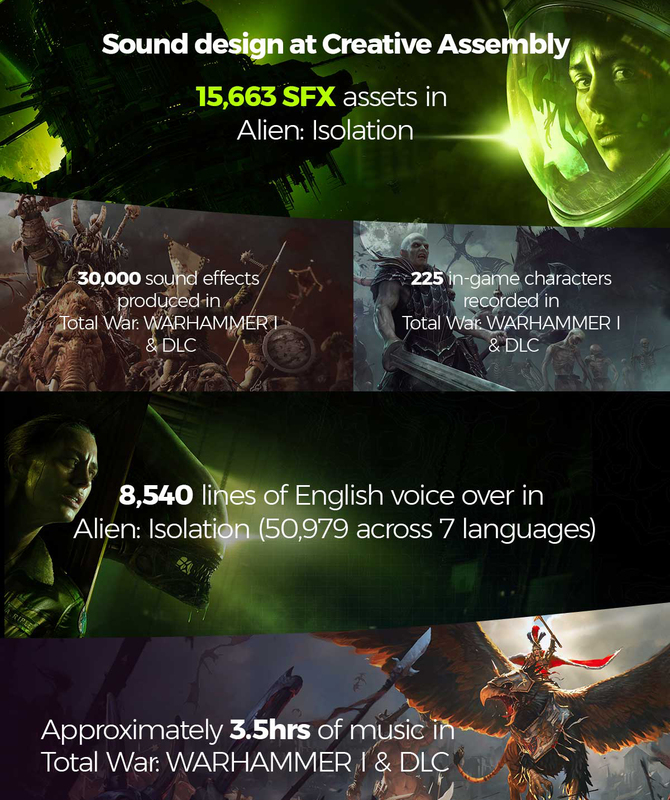 To achieve the signature sounds of Halo, the iconic screeching of one of cinemas deadliest predators in Alien: Isolation or the mythical spells and giant battles of Total War, our audio team are involved in a huge array of creative sound endeavours. The benefits of having an in-house audio team are huge for the overall game development process and achieving deep, immersive game experiences for our fans. For example, the Creative Assembly audio team will work closely with game designers to provide sound for a particular interactive game mechanic, or liaise with the narrative team to highlight a climactic moment in the story that needs to evoke a particular emotion, or bringing a creature animation to life with vocal or Foley sounds. We invest in our facilities, having created 13 in-house studios and 2 live rooms to give our 24-person strong team the best tools to excel. 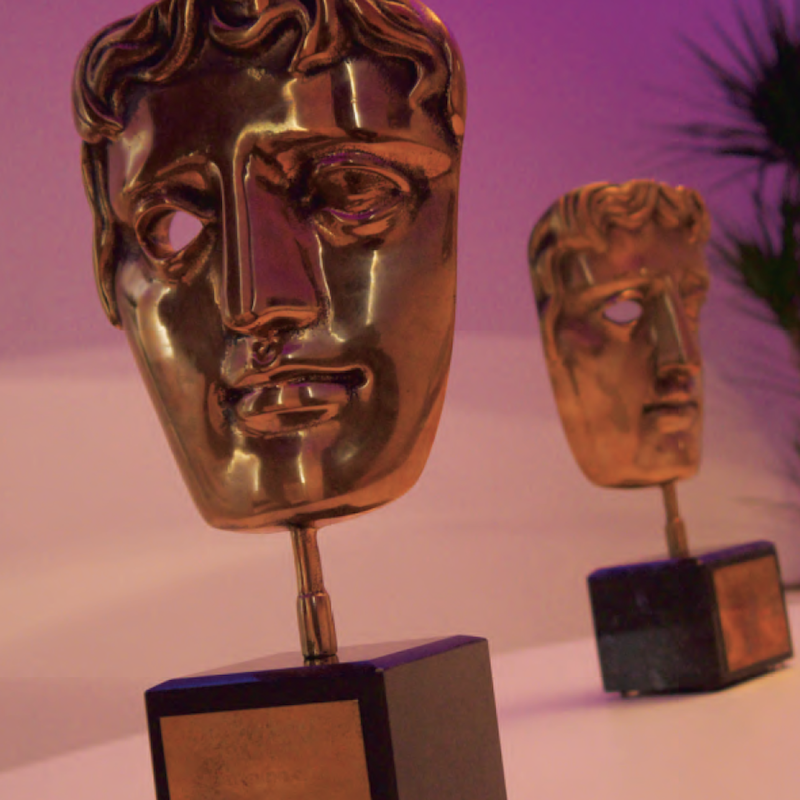 Our audio has won us BAFTAs, Ivor Novellos and countless more awards. Our dedicated programmers work alongside audio teams to design and build applications and plugins to support the best development. We use the game editor CAGE to combine construction of levels and audio/vfx with advanced scripting tools. We have dedicated teams of sound designers, dialogue engineers, music staff, programmers and QA. In Total War, all our dialogue is recorded and produced in-house by our dedicated team. 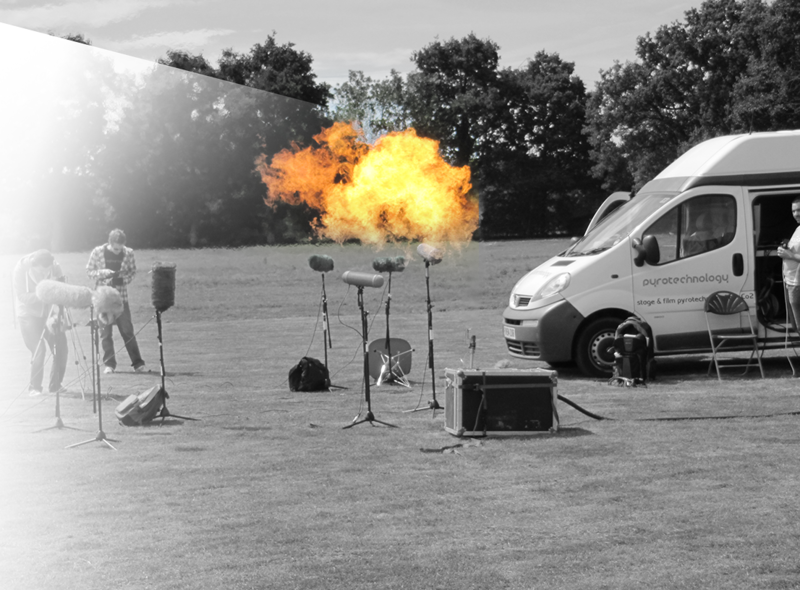 We produce AAA games and are often out on field recordings, recording celebrity actors, orchestras, and choirs around the world. In Total War: WARHAMMER we created the language of the Dark Tongue of Chaos, later recording it live with a choir as part of the soundtrack in Budapest. With Halo Wars 2 our field recording sessions involved a lot of explosives, firearms and tanks. Revisit the sound design of Alien: Isolation with interviews from Creative Assembly on Sound Architect and AudioTechnology. Sound Designer, Charles Patemen, talks about the difference between game audio and linear media. James Magee breaks down the different aspects of game audio in this must read for any aspiring Sound Designers. Senior Dialogue Engineer, Will Tidman, looks at creating dialogue in a nonlinear environment. BBC News discovered the art of game audio, featuring Alien: Isolation. Audio Lead, Sam Cooper and Senior Sound Designer, James Magee talk about explosives, flamethrowers and balancing competing sounds in Halo Wars 2. Audio Director, Rich Beddow, talks about how the fantastical sound of Total War: WARHAMMER II is achieved. You can also read past articles on composition workflow for orchestral soundtracks and scoring for Total War. Our Creative Chronicles series focuses on different areas of games development. Previous editions include Art and Programming.